"It is the Soviet Union that runs against the tide of history by denying human freedom and human dignity to its citizens." "The center of world power is the unchallenged superpower, the United States, attended by its Western allies...For a small but growing chorus of Americans this vision of a unipolar world led by a dynamic America is a nightmare...Our best hope...is in American strength and will-- the strength and will to lead a unipolar world, unashamedly laying down the rules of world order and being prepared to enforce them." "The genius of American power is expressed in the movie The Godfather II, where, like Hyman Roth [Meyer Lansky! ], the United States has always made money for its partners. America has not turned countries in which it intervened into deserts; it enriched them. Even the Russians knew they could surrender after the Cold War without being subjected to occupation." 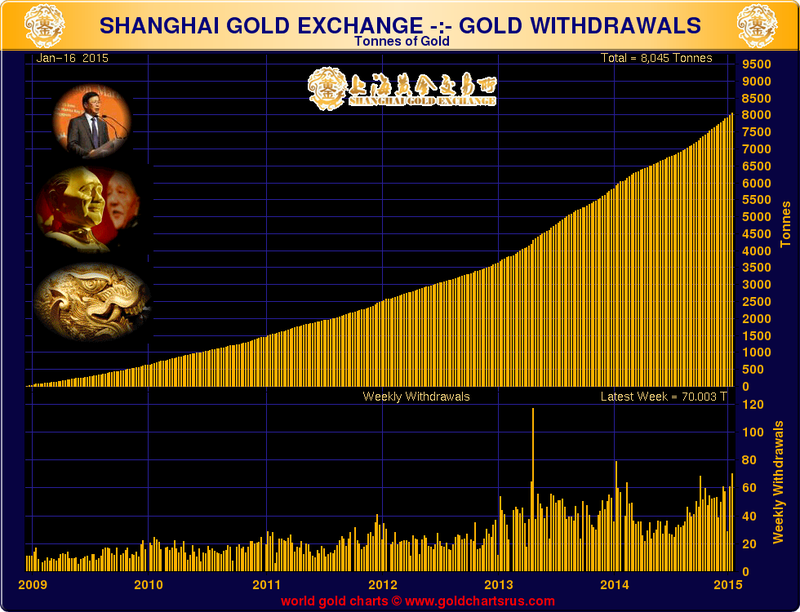 China withdraw around 70 tonnes of gold bullion from the Shanghai Gold Exchange for the week ending 16th January. This is the third highest amount of gold offtake from Shanghai ever. As a result of price rigging, gold is flowing steadily from West to East. Because, whether the public realizes it or not, the world is very actively engaged in the evolution of the monetary basis of world trade, which has been referred to here and other places as the currency wars. I have little doubt that the Western central banks think that their triumph is unstoppable, an inevitability. And so they firmly stand against all evolution and change, preferring to fight tooth and nail to maintain the US dollar supremacy. I believe that this currency war has its genesis in the grandiose schemes of the highly influential neo-cons and financiers in the Clinton, Bush, and Obama administrations, together with their attendant counterparts overseas. I suspect that they may be in for a surprise. Events have a way of rising to an occasion of hubris. Now, putting aside any moral or practical political discussions about this, let us just consider one thing. Let us assume for a moment that all this circumstantial and direct evidence is correct, and there is a currency war underway. And that the Banks have been engaged, for many years, in the systematic rigging of the price of gold. This is not impossible, a conspiracy fantasy, or even all that improbable for that matter, since we know that many of these same actors did a similar thing for much the same motives in the famous London Gold Pool. Assuming that this is true: what is likely to happen if this gold currency rig fails again? Chart courtesy of data wranger Nick Laird at goldchartsrus.com. History shows again and again, how nature points out the folly of men.